I don't even know where to really start with this review. I am so sad to see Anna and Kaidan's journey come to an end. It was a truly bitter sweet moment. "Life was often so cruel, so ugly. And then, in the midst of all the madness, a precious gift would be placed in your lap. Because life could also be so sweet." And that is the truth of it. This book has its moments of cruelty, sadness (Wendy, I still forgive you for that one thing, it's okay, it makes sense...you made it okay. ), regrets, fear, hurt, but mostly love. 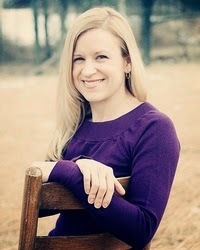 If there is one thing that Wendy Higgins does and does very well is she knows how to write a sweet story. One that tugs at every emotion, wraps your heart in sadness wrapped in joy (almost like taking anything and wrapping it in bacon *winks*), sets you on your way knowing that everything, even through the worst, everything is going to be okay. The transofrmation of our sweet Anna through the series and especially in this last book is inspiring. While shy, uncertain at times, she never gave up or gave in. She loved her friends and family, she loved Kaidan, never wavering from that one truth. "We, the Nephilim, were going to rid the earth of demons, and I was slated to lead the way. This knowledge sparked, caught fire, and spread through my veins. Despite all the unknowns, I'd never felt stronger or more focused. And love was to blame...that very essence of life believed to be a weakness." She is a strong heroic female character. One who while she leads with her heart considers all outcomes to her actions. She doesn't go through her life lightly, believes in a strong foundation, knows that she can take care of herself, but also knows that she can lean on her family and friends and when to do it. I think Anna sets a wonderful example for our girls. I have two myself and would be overly proud to know that they had Anna's characteristics. ""Oho, so it's like that, huh?" I hopped off the stool, surprised by my own ability to feel lighthearted at the moment, but sometimes boys needed to be taught lessons about underestimating girls." Kaidan, Kaidan, Kaidan. What can be said about this boy. I've wanted to smack him, shake him, hug him, cry for him, and jump for joy for him. What a jumble of emotions. We finally see Kaidan become his own man in this last book and I just can't even describe the happiness that caused for me. Yes, he was the ultimate bad boy, but always there lurked a quiet loving soul underneath and while he will never be a simple man (who wants that anyway) we are allowed to see him at his most gentle. "As I drifted to sleep from a state of semiconsciousness I heard him whisper, "You're my dream. My only dream."" You can't tell me that doesn't tug at your heart. This bad boy grows into an amazing man. I just, I have no words. The end of the book...the end, oh my that end...it says it all! To Patti, Blake, Ginger, Marna, Kope, Duke Belial, Jay...my sweet dear Jay. What an amazing cast of characters. I just loved them all. Each one brought so much to this series and I am going to miss them as if they were my own real life friends. 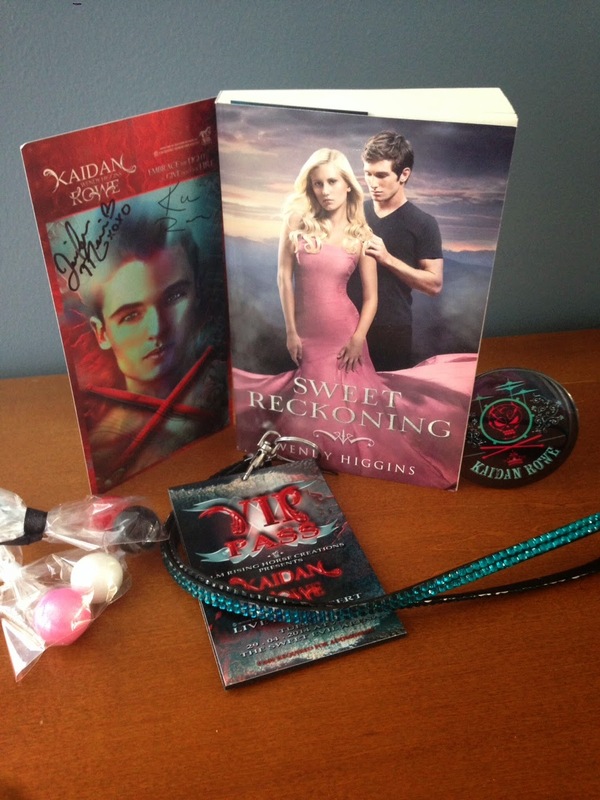 Also a signed copy of Sweet Reckoning, with a Kaidan Rowe button, a signed (by Kaidan Rowe and artist and creator Jennifer Munswami from J.M. 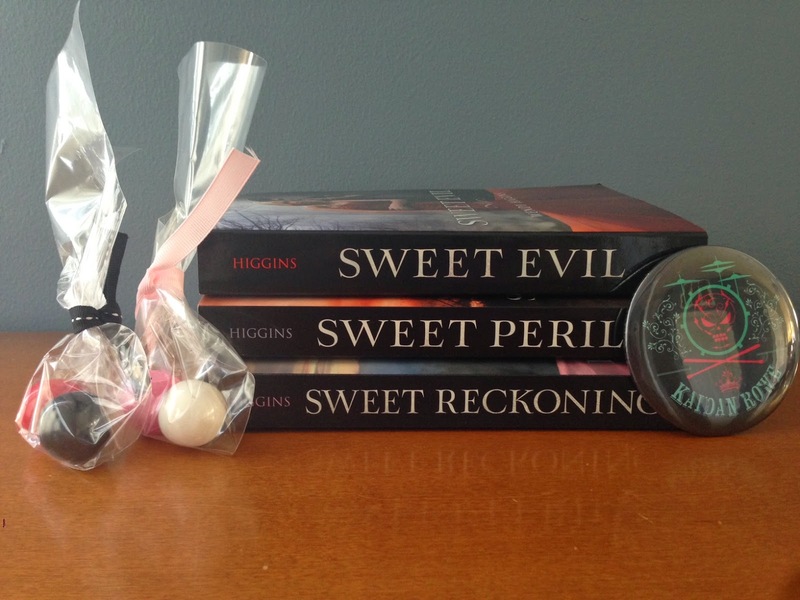 Rising Horse Creations Facebook) Lascivious ticket as well as a Backstage pass created by Jennifer, and of course some Sweet/Evil gumballs. You are so welcome, it is a wonderful series. I hope that even if Rafflecopter doesn't pull your name from the 'hat' you will get a chance to read them! Thank you for entering and good luck! I know I totally love them all and we need a I sway for Jay (or something like that, haha). Can't wait to hear what you think! It's a great series with some wonderful characters, I look forward to hearing your thoughts on Kai, Blake, and Kope. I sigh for KAI!!! Love Kaidan! I am so looking forward to this book! It's a great finale! I hope you love it. Ana and Kai are one of my all-time favorite couples! I love them so much. *cries* My library hasn't processed Reckoning yet, so I have been checking their website every few minutes all week. Can't wait to be crushed by the end. I know, I love them so much! The conclusion is just........ Wendy knows how to wrap up a series! Congratulations to the winners!! AWESOME prize to be able to win! !